IBM’s 2012 Tech Trends Report: Skills, Skills, And More Skills! Across the four technology areas covered in the 2012 IBM Tech Trends Report – mobile, business analytics, cloud and social business – only one in ten organizations has all the skills it needs. These shortages are not trivial or isolated. Within each area, roughly one-quarter report major skill gaps, and 60 percent or more report moderate to major shortfalls. Okay boys and girls, it’s that time of year. No, not the time for Saint Nicholas to come shooting down your chimneys to deliver lots of tablets and smartphones for Christmas. That time will come soon enough. No, I’m referring to the results from IBM’s third annual Tech Trends Report, where we talk to an extended sample of technology decision makers to find out what’s on their minds. In 2010, I explained from the results that it was all about mobile and the cloud. Last year, the headlines centered on IBM’s Watson technology and business analytics. This year…while we wait for the drum roll, let me first tell provide you with some background about this year’s study. The 2012 Tech Trends Report is based on a survey of more than 1,200 professionals who make technology decisions for their organizations (22 percent IT managers, 53 percent IT practitioners, and 25 percent business professionals), and who come from 16 different industries and 13 countries (which span both mature and growth markets). IBM also surveyed more than 250 academics and 450 students across those same countries in order to better understand how tech trends are impacting future IT professionals. According to this year’s survey, what’s old is new. Mobile technology, business analytics, cloud computing, and social business continue to be emergent key themes. What’s new is this: Though new and exciting business possibilities are emerging from these new capabilities, significant IT skills shortages, combined with lingering security concerns, are threatening adoption and business progress. By way of example, the survey revealed that only one in ten organizations has all the skills it needs, and within each of the four areas previously mentioned, roughly one-quarter of respondents report major skills gaps, and 60 percent or more report moderate to major shortfalls. The skills shortage is more acute in mature markets, with roughly two-thirds of respondents indicating moderate to major shortages versus roughly half in growth markets. With respect to security concerns, they consistently rank as the most significant barrier to adoption across mobile, cloud computing and social business. The report observes that IT security is not just a technology concern, however. It’s a broad business issue with far-reaching policy and process implications, and notes that moving into mobile means organizations must address the increased risk of data loss and security breach, device management challenges, and complications introduced by the growing trend toward “bring-your-own-device” (BYOD). In cloud computing, it calls for policies on employee use of public cloud services, segregation of data within shared or hybrid cloud solutions, and ensuring the right data is in the right place subject to the right controls. In social business, organizations need to consider customer privacy expectations, regulatory compliance, and employee guidelines on confidentiality, acceptable use, and protecting the corporate brand. So with all this in mind, which organizations are better positioned to create competitive advantage? Early adopters or late arrivers? Those focused on strategic impact or tactical implementations? The data suggest it’s those companies forging ahead faster (in spite of adoption hurdles) and using mobile, analytics, cloud, and social technologies in more strategic ways. The so-called “pacesetters” believe emerging technologies are critical to their business success and are using them to enable new operating/business models. They’re also adoption ahead of their competition. What sets them apart from the “followers” and “dabblers” are three key factors: They’re more market driven, they’re more analytical, and they’re more willing to experiment. And where they say they’re headed next also provides a learning opportunity. More than 75 percent of pacesetters are increasing investments in mobile and cloud computing over the next two years, and they’re betting heavily on business analytics and social business (two to three times as many pacesetters are raising those investments by 10 percent or more). With respect to skills, 70 percent of pacesetters are building capabilities in mobile integration, security, privacy, and mobile application architecture, design and development. Twenty-eight percent have already developed business analytics expertise in probability, statistics and mathematical modeling (and another 60 percent are eagerly developing those capabilities). In cloud computing, more than 70 percent are developing skills in cloud security, administration, and architecture. The 2012 IBM Tech Trends Report data suggests an opportunity for organizations everywhere to help close the large and expanding technology skills gap. Is your organization prepared to take these important and often necessary actions? And nearly one-quarter of them have already built the expertise needed to extend social business solutions to mobile and to perform social analytics. Their intent to combined technologies — mobile and social, social and analytics, etc. — are helping drive even greater business value for their organizations. The 2012 IBM Tech Trends Upshot? CEOs understand the external factors impacting their organizations most: Technology and skills. But one without the other is a recipe for innovative decline, and to effectively address these interconnected imperatives, business and IT executives need new approaches for bridging skills gaps and helping their organizations capitalize on the strategic potential of emerging technologies. The figure to the right demonstrates specific actions that can help you as a leader move your organization into a pacesetting position. And IBM is also stepping up and offering some new skills-building initiatives as well. On the heels of this study, IBM has announced an array of programs and resources to help students and IT professionals develop new technology skills and prepare for jobs of the future. The initiatives include new training courses and resources for IT professionals, technology and curriculum materials for educators and expanded programs to directly engage students with real-world business challenges. You can learn more about those here. CMO Talk: What If Everything You Knew About Marketing Changed? Click to enlarge. The practice of marketing is going through a period of unparalleled change, putting CMOs everywhere to the test. However, you can seize the opportunity to transform your marketing function. 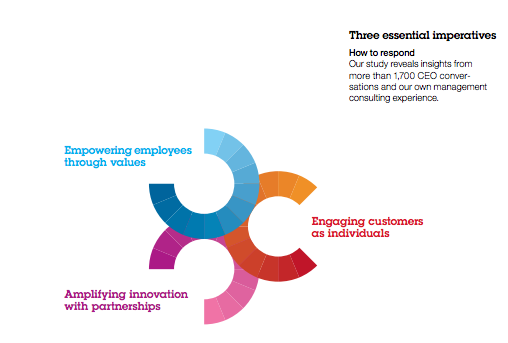 The combined insights of the 1,734 senior marketing executives participating in IBM’s Global CMO study point to three strategic imperatives that can strengthen your likelihood of success, as outlined in the graphic above. Contrary to popular opinion, we don’t all know one another at IBM. I know, I know, it’s hard to believe, considering there’s only 400,000+ plus of us — you’d think we all knew one another, but we don’t. But the good news is, we’re always making new acquaintances inside IBM. That was the case at the Word of Mouth Marketing Association Summit I attended last week in Vegas, where I finally got to meet face-to-face my colleague, Carolyn Heller Baird. Carolyn was also in attendance at WOMMA, where she presented the CMO findings in some detail before a sizable audience. I sat down with Carolyn to talk about the study’s findings in more detail, and to also try and better understand the implications for marketers in general, and social media practitioners in specific. Before I hand you off to our interview below, I want to highlight the fact that the study results are still available via download here. As the study concluded, half of all CMOs today feel insufficiently prepared to provide hard numbers for marketing ROI, even as they expect that by 2015, return on marketing investment will be the primary measure of the marketing function’s effectiveness. There’s a gap to close there, and Carolyn’s comments in the video provide some actionable insights on to how to start to close it! IBM’s recent study on “The Business of Social Business” revealed three major areas where organizations can most effectively apply their social business investments. The study surveyed more than 1,100 businesses worldwide, and included extensive interviews with more than two dozen widely recognized leaders in social business. You can find a link to a downloadable version of the study later in this blog post. If you’ve been looking for a study that will help you better understand how organizations around the globe are viewing the opportunity social business presents as a fundamental way by which to rethink and overhaul how they conduct their business operations in the social age, IBM has something for you. This was a survey conducted of more than 1,110 businesses around the world, and with extensive interviews with more than two dozen recognized global leaders in social business. Many of those executives explained to IBM that, in fact, social business is gaining traction in their organizations. Top line, 46 percent of the companies surveyed increased their investments in social business in 2012, and 62 percent indicated they were going to increase their expenditures in the next three years. As the executive summary of the report stated, “The question surrounding social media today is not whether you are doing but, but whether you are doing enough. Is your use of social media allowing your organization to engage with the right customers, improve their online experience, and tap into their latest insights and ideas? And does your social approach provide your customer-facing representatives with the ability to search the globe for expertise or apply learnings? 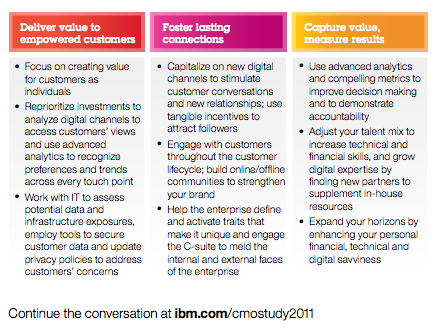 IBM defines social business as embedding tools, media, and practices into the ongoing activities of an organization. It enables individuals to connect and share information and insights more effectively with others, both inside and outside the organization. Social business tools facilitate engagement in extensive discussions with employees, customers, business partners, and other stakeholders and allow sharing of resources, skills and knowledge to drive business outcomes. And what’s the upside? Top-line growth for social business users can improve between 3 and 11 percent, according to a recent study from the McKinsey Global Institute, and productivity can be enhanced by between 2 and 12 percent. For those who have been involved in the social media realm to date, it’s important to note that social business is about moving beyond basic promotional activities to encompass the entire customer lifecycle, including lead generation, sales, and post-sales service. 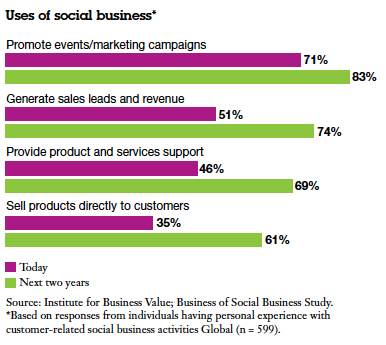 The IBM study had a sub-sample of clients with some social business experience which revealed that while the percentage of companies expecting to use social business for promotional activities will rise slightly, from 71 percent today to 83 percent in the next two years, the number of companies expecting to use social approaches to generate sales leads and revenue will increase dramatically. How companies are using social business capabilities is evolving rapidly. As you can see in the graphic, it is moving beyond basic promotional activities to encompass the entire customer lifecycle, including lead generation, sales, and even post-sales service. Today, 51 percent use social approaches for leads and revenue, while 74 percent plan to get on board in the next two years. Post-sales support is also expected to increase, from 46 today to 69 percent over the next two years (see graphic entitled “Users of Social Business”). Regardless of where your organization is in its own social business journey, the use of social business practices is a transformation that leads toward new ways of working. IBM’s research revealed three essential actions to be taken across the enterprise, from the CEO’s office to the farthest corner of the organization. Develop social methods and tools to create consistent and valued customer experiences. Embed social capabilities to drive workforce productivity and effectiveness. 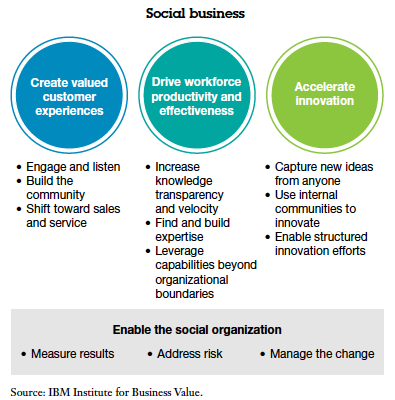 Use social approaches to accelerate innovation. If you’re interested in reading the full study, you can register to download it here. As IBM’s vice president for social business, Sandy Carter, explained in the video interview below during our recent interview at the IBM Interconnect in Singapore, “culture eats strategy for lunch.” Sandy offered up some great advice on world-class social business practices, as well as how companies and individuals can better establish their brands in an increasingly crowded social marketplace. IBM continued its rolling tide of market insights with the announcement this morning of its global study of midmarket CEOs. The headline: Nearly twice as many smaller- and medium-sized business CEOs see creating a more collaborative work environment with a higher level of openness and transparency as a top priority compared to the findings from the IBM CEO study conducted in 2010. A total of 45 percent of midmarket CEOs see the need to create a more open business environment, a close to 50 percent jump from two years ago. 71 percent are focused on improving their understanding of individual customer needs. CEOs also discussed the whirlwind of “social”change they’re witnessing. Facebook, Renren, Twitter, Weibo, Foursquare and other social media upstarts have changed the way products and services are marketed to consumers. Despite the surge in social media adoption around the world, only 15 percent of midmarket CEOs are using social media platforms to connect with the individual consumer today. Three to five years from now, that number is poised to spike to 50 percent. Market dynamics and technological advances continue to force more organizational change, significantly impacting how midmarket businesses engage with customers and employees and drive innovation. Midmarket CEOs are now looking to technology not only to make them more efficient but also to enable increased collaboration and create relationships — essential connections to fuel creativity. Rising complexity and escalating competition have also made partnering a core innovation strategy for many organizations. As midmarket businesses become more geographically diverse and interact with other organizations, the importance of sustaining a collaborative business culture will only continue to grow. Those that are perceived to be collaborative often find it easier to partner with other successful companies. In fact, about 50 percent of midmarket CEOs see partnering or collaborating as a way to stay on the path of innovation. In addition, given the market pressures to operate with greater openness and transparency, CEOs are looking for employees who will thrive in this kind of atmosphere. CEOs are increasingly focused on finding top talent with the ability to constantly reinvent themselves. These employees are comfortable with change; they learn as they go, often from others’ experiences. CEOs regard interpersonal skills of collaboration (72 percent), communication (68 percent), creativity (58 percent) and flexibility (66 percent) as key drivers of employee success to operate in a more complex, interconnected environment. Organizations are under intense pressure to respond to not only how customers want products and services delivered, but also when and where. Businesses can profit from unique insights they discover about customers. In fact, 65 percent of midmarket CEOs identify customer insights as the most critical investment area. Finally, mobility is elevating customer expectations and creating new challenges for CEOs. Midmarket clients have a tremendous opportunity to create value out of immediacy to be ready with relevant services and information in the context of the moment. As mobile commerce is expected to reach $31 billion by 2016, companies will need to take advantage of location based services and new forms of commerce in which mobile is integrated into a consumer’s multichannel experiences, tailored to the individual, to stay competitive. “Midmarket CEOs are establishing more open and collaborative cultures —in which employees not only connect more with each other and the outside world to innovate, but to reinvent themselves. Learning from each other, they stay ahead of the skills curve and open to change,” said Andy Monshaw, General Manager of IBM Midmarket Business. You can learn more about the IBM Midmarket 2012 CEO Study here. If you’ve been watching any of the Livestream coverage emerging from the IBM Innovate event down in Orlando, you know that skills is a key issue facing software development shops everywhere. The need for new and changing skills, skills for new platforms and development languages, skills to help pull it all together. Today, IBM made an announcement from Innovate that it is working to help address the skills issue in a new partnership with Syracuse University intended to help college students build computing skills to manage traditional and new systems in large global enterprises. As business value creation increasingly shifts to software, the skills needed to tackle disruptive technologies like cloud and mobile computing, particularly for enterprise-class, large industrial systems, have become critical. Lack of employee skills in software technologies is cited as the top barrier that prevents organizations from leveraging software for a competitive advantage, according to initial findings in IBM’s Institute for Business Value 2012 Global Study on Software Delivery. And according to IBM’s 2012 Global CEO Study, including input from more than 1,700 Chief Executive Officers from 64 countries and 18 industries, a majority (71 percent) of global CEOs regard technology as the number one factor to impact an organization’s future over the next three years — considered to be an even bigger change agent than shifting economic and market conditions. Syracuse University’s Global Enterprise Technology (GET) curriculum is an interdisciplinary program focused on preparing students for successful careers in large-scale, technology-driven global operating environments. IBM and a consortium of partners provide technology platforms and multiple systems experience for the GET students. IBM’s Rational Developer for System z (RDz) and z Enterprise Systems help students build applications on multiple systems platforms including z/OS, AIX, Linux and Windows. Close to 500 students have participated in the Global Enterprise Technology minor since its inception. Syracuse University’s iSchool is the No. 1 school for information systems study, as ranked by U.S. News and World Report, and serves as a model for other iSchools that are emerging around the globe. More than 120 new clients worldwide have chosen the IBM mainframe platform as a backbone of their IT infrastructure since the IBM zEnterprise system was introduced in July 2010. The zEnterprise is a workload-optimized, multi-architecture system capable of hosting many workloads integrated together, and efficiently managed as a single entity. Syracuse University is a participant in IBM’s Academic Initiative and was a top ranked competitor in IBM’s 2011 Master the Mainframe competition. As today’s mainframes grow in popularity and require a new generation of mainframe experts, the contest is designed to equip students with basic skills to make them more competitive in the enterprise computing industry job market. IBM’s Academic Initiative offers a wide range of technology education benefits to meet the goals of colleges and universities. Over 6,000 universities and 30,000 faculty members worldwide have joined IBM’s Academic Initiative over the past five years. 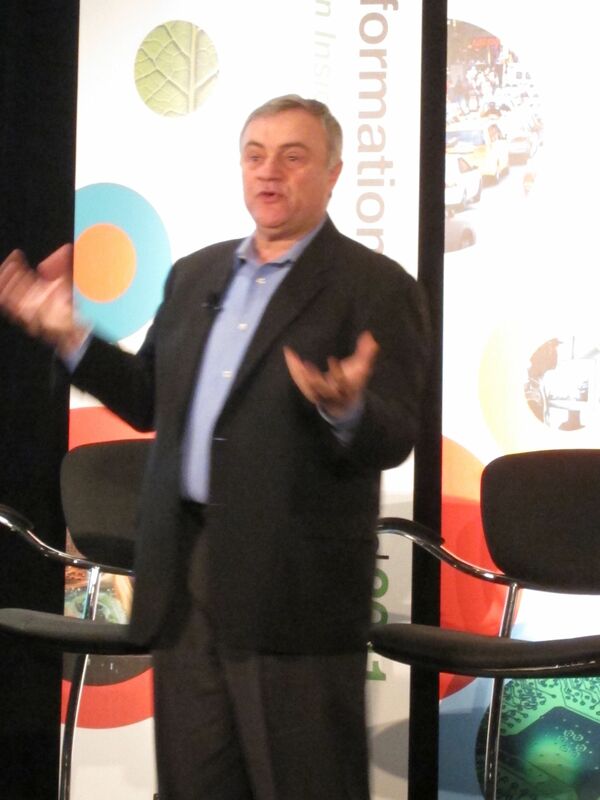 Today, here at Information On Demand 2011 in Las Vegas, Nevada, IBM unveiled new software that brings the power of managing and analyzing big data to the workplace. Whether in the office or on the road, employees can now gain actionable insight anytime, anywhere from the broadest range of data and put it to work in real-time. IBM Senior VP Steve Mills explains the "why" of business analytics at today's press conference here at Information On Demand 2011 in Las Vegas, Nevada. The new offerings span a wide variety of big data and business analytics technologies across multiple platforms from mobile devices to the data center to IBM’s SmartCloud. Now employees from any department inside an organization can explore unstructured data such as Twitter feeds, Facebook posts, weather data, log files, genomic data and video, and make sense of it on the fly as part of their everyday work experience. With today’s news, IBM is placing the power of mobile analytics into the hands of iPad users with a free software download at Apple’s iTunes Store. The new software is designed to help employees in key industries such as financial services, healthcare, government, communications, retail, and travel and transportation use and benefit from business analytics on the go. Organizations of all sizes are struggling to keep up with the rate and pace of big data and use it in a meaningful way to improve products, services, or the customer experience. Every day, people create the equivalent of 2.5 quintillion bytes of data from sensors, mobile devices, online transactions, and social networks; so much that 90 percent of the world’s data has been generated in the past two years. Every month people send one billion Tweets and post 30 billion messages on Facebook. Meanwhile, more than 1 trillion mobile devices are in use today and mobile commerce is expected to reach $31 billion by 2016. A 2010 IBM/MIT Sloan Management Review survey of 3,000 executives across 30 industries from 100 countries reveals that 60 percent of respondents said they have more data than they can effectively use. A new IBM study of 1,700 chief marketing officers from 19 industries and 64 countries further exposes this issue with 71 percent saying their organizations are unprepared to handle the explosion of big data. New Hadoop-based analytics software on the cloud that can be up and running in less than 30 minutes. The new software helps employees tap into massive amounts of unstructured data from a variety of sources including social networks, mobile devices and sensors. New predictive analytics software with a mapping feature that can be used across industries for marketing campaigns, retail store allocation, crime prevention, and academic assessment. New software that sifts through all types of data behind the scenes and ranks its quality, makes it secure, and ensures business decisions are based on trusted data. IBM InfoSphere BigInsights on the IBM SmartCloud Enterprise makes big data analytics accessible for any user inside an organization. Like the on-premise version, BigInsights on the cloud analyzes traditional structured data found in databases along with unstructured data — such as text, video, audio, images, social media, click streams, log files, weather data — allowing decision makers to act on it quickly. Bringing big data analytics to the cloud means clients can capture and analyze any data without the need for Hadoop skills, or having to install, run, or maintain hardware and software. BigInsights on the cloud is available in both basic and enterprise editions with the options of public, private and hybrid cloud deployments. The basic edition is an entry-level offering available at no-charge that helps organizations learn how to do big data analytics including “what-if” scenarios with its BigSheets component. Clients can seamlessly move to the enterprise edition when ready and set up Hadoop clusters in under 30 minutes to start analyzing data with low usage rates starting at $0.60 (US) per cluster, per hour. Both versions include a developer sandbox where clients can develop a new generation of business analytics applications complete with tools and a test and development environment. Today, market leaders in banking, insurance, retail, communications and digital entertainment are using BigInsights on the cloud to analyze massive amounts of unstructured data. These clients are analyzing data flowing from social networks, sensors, mobile devices, log files, and voice and video systems to understand consumer sentiment, make computing networks and smart grids more secure, and create new customer experience programs. IT professionals and students looking to build Hadoop skills can take advantage of IBM’s BigDataUniversity.com, a new web site where users can learn the basics of Hadoop, stream computing, open source software development, and database management techniques to prepare for careers as Data Scientists. The site includes hundreds of easy-to-use tutorials, videos, and coding exercises geared to build Hadoop, BigInsights, DB2 and WebSphere skills, and many courses are free. More than 8,000 students worldwide have already registered from countries such as Brazil, Russia, China, India, Korea, and South Africa and the US. IBM continues to advance business analytics for the 21st century workforce by delivering expanded mobile device support with IBM Cognos Mobile software for the iPad. The software enables mobile workers to take their business analytics on the road whether offline or online, allowing for uninterrupted productivity. iPad users can enjoy a rich, visual business intelligence experience to analyze any data about their business including sales, customer, and financial data with reporting, dashboard and scorecards. Cognos on iPad is designed to help employees in key industries such as financial services, healthcare, government, communications, retail, and travel and transportation use and benefit from analytics on the go. For example, doctors and dentists can use it to analyze electronic medical records and show patients customized treatment plans and explain procedures based on that analysis; social workers can check the health and well being of children in foster homes throughout a city and update supervisors, police and courts on their status in real-time; and bankers and insurance agents can use it to analyze loan or policy data to create individual products or services for clients. Cincinnati Zoo, one of the oldest zoos in the United States with more than 1.2 million visitors annually, uses Cognos on iPad to give management instant access, and a single view of visitor and business information to drive new revenue and improve member visits. The flexibility of mobile business analytics allows managers to bring together sales and attendance data on their iPads from wherever they are inside the park to track purchase patterns and adjust marketing spend based on that information. Using Cognos software, the Zoo has increased in-park spending by 25 percent this year. With today’s news, IBM is delivering new software that allows organizations to gain predictive intelligence on geographic data. Organizations can use the software to understand data, analyze trends, forecast, plan and validate assumptions to drive accurate conclusions. SPSS Statistics 20.0 software includes a new mapping feature that gives users the ability to add a geographic dimension to analysis and reporting, and allows users to target, forecast, and plan by geographical areas. This mapping feature can be used across industries to analyze data and create statistics for marketing campaign effectiveness, store allocation decisions in retail, to detect crime hot spots, and for student test score assessments. The software comes with views of the United States, countries, continents, and prebuilt map templates where users can quickly populate them with data including geospatial information from ESRI files. Healthcare organizations can use the new software to visually pinpoint areas of high accident or illness rates, or identify differences in care across different regions of a state or country. Government employees can analyze past and present census data by city block or in dense county populations, and identify high crime areas to allocate more law enforcement, or update tax and zoning changes. Direct marketers can locate their most profitable customer base and store locations to allocate advertising resources, and academia can use it to concentrate recruiting and alumni efforts geographically. 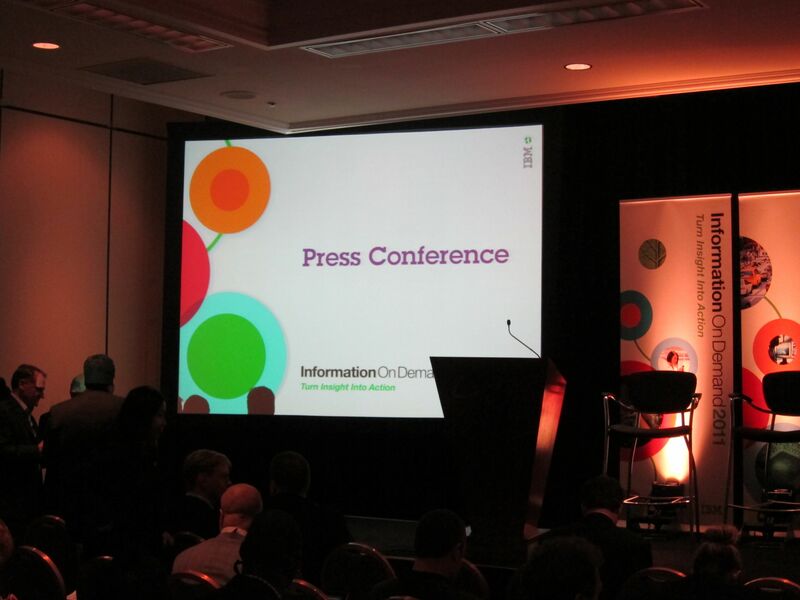 The scene from this morning's press conference at IBM Information On Demand 2011 at the Mandalay Bay in Las Vegas, Nevada. Big data analytics can be a competitive advantage, however, the quality of the analysis is only as good as the data it’s fed, and the data itself has to be available to those who can use it. IBM is the only vendor with a market-leading information integration and governance platform for big data that ensures only trusted information is delivered to business users and applications across the enterprise. New IBM InfoSphere Information Server 8.7 software enables integration with Big Data as both a source and a target for information integration. The proven performance and parallel engine of Information Server provides the massive scalability required for big data. Also new in this release is a next generation connector to Netezza, built for balanced optimization and high performance, and packaged specifically for Netezza implementations, and an operations console to view system usage across all integration jobs, to improve productivity of integration projects. New IBM InfoSphere Master Data Management 10 software unifies IBM’s market leading MDM capabilities into a single product that handles any MDM requirement. New features include integration with Business Process Management software for MDM-centric business processes, greater connectivity to consuming applications via adaptable service interfaces, and a shared matching engine that maintains the single version of the truth. MDM technology improves the outcome of Big Data analytics by providing a better understanding of customers, products, suppliers, employees and accounts for further analysis. With today news, IBM also announced that hundreds of new clients are turning to IBM to gain actionable insight on the broadest range of big data. Whether it’s collecting data to manage the placement of windfarms, gauge customer sentiment on social media sites, or predict potentially fatal infections in hospitals, IBM is helping clients across every industry to put their data to work. Clients such as Hertz, Beacon Institute, KTH Royal Institute of Technology, Marine Institute Ireland, Technovated, [x+1], TerraEchos, University of Ontario Institute of Technology and Uppsala University are using IBM analytics technologies to address the growing volume, velocity and variety of big data, and use it to make decisions that are transforming their industries. Danish energy company Vestas Wind Systems is using IBM’s big data software to analyze petabytes of weather data to improve wind turbine placement for optimal energy output. Analysis that used to take weeks can now be done in under one hour. XO Communications has reduced its customer churn rates by nearly 50 percent using IBM SPSS predictive analytics software. The company can predict customer behaviors, spot trends, and identify those likely to switch to another carrier, allowing them to take steps to keep their most valuable customers. [x+1], an end-to-end digital marketing platform provider, is helping their clients realize a 20 percent growth in digital sales by analyzing massive volumes of advertising data in real-time using IBM Netezza technology. Worldwide advertising agency Ogilvy is using IBM’s analytics software for the iPad to help employees assign resources, track utilization rates, and identify new revenue opportunities on the fly. To read about more clients that are tackling big data challenges with IBM analytics technologies, download the new IBM Big Data Book at http://www.ibm.com/bigdata. Follow breaking news from Information On Demand 2011 on Twitter at #iod11.